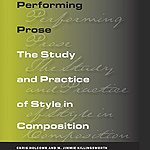 Dog Lake Music Corp is proud to announce that Jeff Evans has voiced Performing Prose: The Study and Practice of Style in Composition, a textbook about rhetoric written by Chris Holcomb and M. Jimmie Killingsworth and published by Southern Illinois University Press. Anyone interested in how to use the English language more effectively in both written and spoken presentations will find this book quite useful! Performing Prose is available through Amazon, Audible, and iTunes. Your browser does not support the HTML 5 audio element.